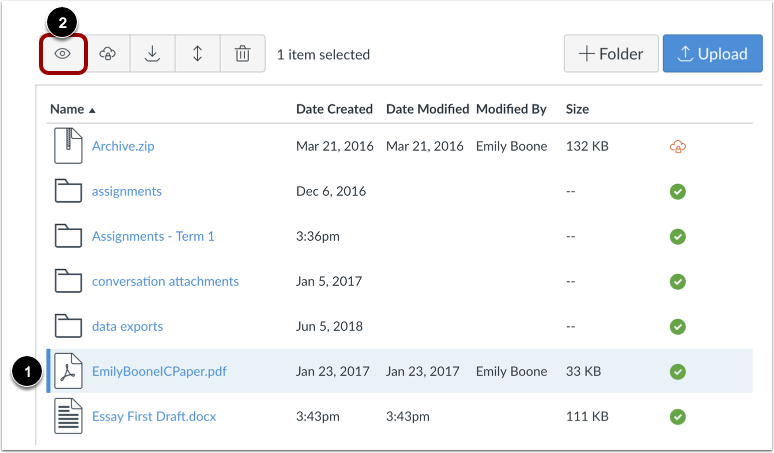 You can preview a file in a course, group, or user file storage area. In user, group, or course files, click the name of the file you want to preview. Note: Some instructors will lock files or folders so students can't access them. Also, some file types may not render a preview. You can also click the line item for the file and click the View icon. The preview toolbar displays the file and file information details, as well as a link to download the file . For documents , you can scroll through the document, zoom in and out, and view the document in full screen. Previous Topic:How do I upload a file to my user or group files? Next Topic:How do I upload ZIP files as a student? Table of Contents > Files > How do I preview a file as a student? Re: Why can't I display files in browser anymore?